The graph shows single family homes for sale and sold in Westerville schools for the past 15 months. Home sales were up 49.4% in May 2010 from a year earlier. The red line is pending sales. Qualified purchasers who put a home in contract before April 30, 2010 were subject to a tax credit. City of Westerville neighborhoods including Annehurst, Heritage Estates, Millstone Creek and Spring Grove, had home sales during the month. City of Columbus neighborhoods including homes in Brandywine Meadows, Broadview Farms, Pinewood Colonyand and Strawberry Farms had sales in May 2010. Homes sold in May in neighborhoods including Glengary Heights, Hamstead, Huber and Sunbury Woods in Blendon Township in Franklin County. Genoa Township neighborhoods including Covington Meadows, Highland Lakes, Orchard Lakes and Sherbrook had home sales close in May 2010. Three homes in the Village of Minerva Park sold in May 2010. 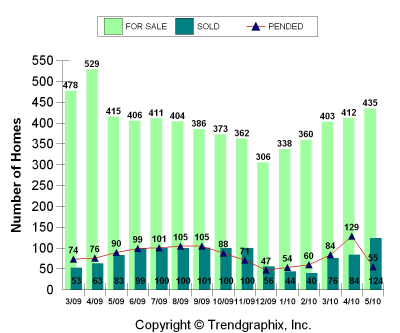 Published June 2010 based on data available from the Columbus Board of REALTORS® at the end of May 2010. TrendGraphix reports presented are based on data supplied by the Columbus Board of Realtors. According to Trendgraphix neither CBR nor their MLS (multiple listing service ) guarantee or are in anyway responsible for its accuracy. “Information deemed reliable but not guaranteed.” There is no guarantee from me either! If you use the Westerville homes for sale link you will search the online inventory of Central Ohio homes on the Real Living HER site. You will be offered the opportunity to receive listings directly from the Columbus Board of Realtors MLS (multiple listing service) in real time. You can know the true status of those properties you are interested in.